A comfortable, breathable Orthopedic Memory Foam Sitting Wedge Cushion that promotes improved posture and relieves unnecessary pressure on the lower back and tailbone. 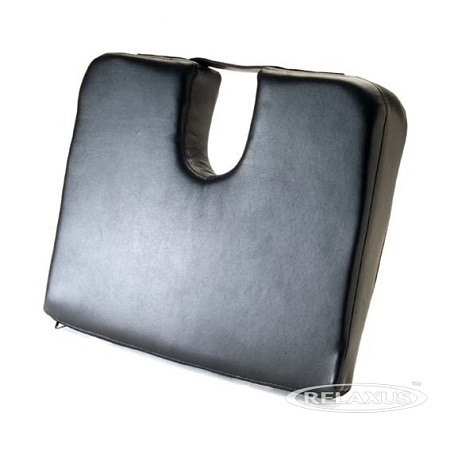 Used as a posture correcting seat cushion or a lumbar support. This Memory Foam Cushion is Hypoallergenic as well! Has a built in handle so it is easy to carry. Encourages proper alignment with its dynamic wedge shape. Good for children and adults. The simple wedge design encourages perfect posture by tipping the lower back forward. Along with the U-shape cut-a-way, the pressure on the lower back and tail bond is alleviated. Ideal for those suffering from pelvis, hip and lower back numbness or pain. When the pressure is taken off the lower back, circulation is improved, allowing the user to sit comfortably for longer periods of time. Top quality, hypo-allergenic memory foam. Removable 2-sided cover with breathable micro-suede side. Foam insert molds around one's natural curves to facilitate proper alignment.